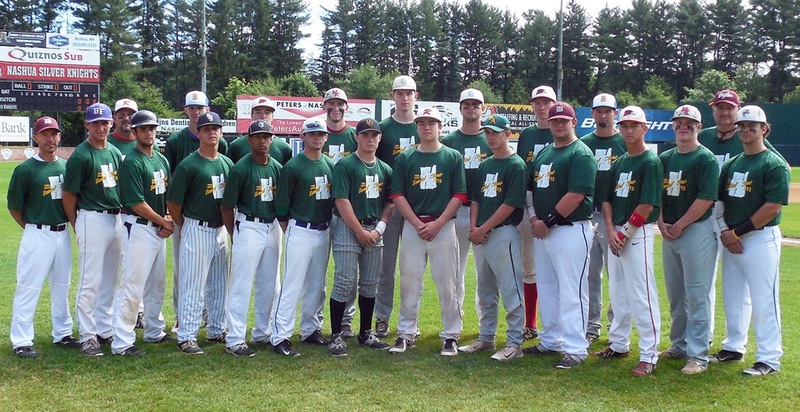 NASHUA, N.H. -- A two-run single in the bottom of the sixth by Kyle Combs (BFA Fairfax) lifted Vermont to a 5-4 game two win over New Hampshire in the 2015 Twin State Baseball Classic doubleheader Saturday at Holman Stadium. New Hampshire took the lidlifter, 3-2, before Vermont bounced back with its comeback-win in the nightcap. The annual matchup between the border rivals resumed after an 11-year absence. It pitted seniors from Vermont's four divisions and division's three and four from the much larger Granite State. Lincoln Pritchard (Mill River) was named the Vermont MVP on the day and Hunter Kretchmar (Somersworth) picked up the honors for New Hampshire. Pritchard retired all nine hitters he faced on the mound in game two and had three hits in both games. Kretchmar, a catcher, also had three singles in two games and threw out two runners on the base paths. In the back and forth nightcap, Combs, who also picked up the win on the mound, singled in Sean Remillard (Rice) and Anthony Phillip (Rice) in the bottom of the sixth after New Hampshire scored a pair of unearned runs to take a 4-3 in the top half. The speedy Phillip was a catalyst for Vermont in both games with three hits, three steals and three runs scored in both contests. Phillip was hit by a pitch to lead the Vermont half of the first in game two, promptly stole second and went to third on a groundout before scoring on an infield throwing error. They added another with two down in the third when Pritchard singled and he rode home on a triple to deep left by Connor Bradley (South Burlington). New Hampshire tied it in it its half of the fifth on RBI-singles by Joey Levesque (Belmont) and Zach Byers (Campbell) while Vermont regained its lead in the bottom on a run-scoring ground out by Tyler Davis (Blue Mountain) to set up the deciding sixth. Phillip had two of Vermont's 11 hits in game two with Bradley's booming triple the lone extra base hit. Four Vermont pitchers limited N.H. to just four singles but the three hitters it walked all scored. In game one Vermont scored one in the first as Tyler Lamphere (Milton) led with a walk and later scored on a two-out single by Pritchard. New Hampshire bounced back with two in its first taking advantage of a pair of walks, a hit batter and two wild pitches. They added an unearned run in the third on a sacrifice fly by Evan O'Keefe (Hopkinton). Base-running by Phillip made it 3-2 as he led the fourth with an infield hit, stole second and third before coming home on a groundout by Joey Robertson (Essex). New Hampshire had six hits and Vermont had five in game one with a double by Vermont's Sean Remillard (Rice) the lone going for extra-bases, Drew Colbert (Somersworth) had a single and walk while Byers reached twice and scored twice. Ben Rexford (White Mountains) picked up the game one victory for New Hampshire allowing just two hits and the first inning run. Davis, the third Vermont hurler, allowed just one hit and struck out two facing just six hitters in two innings. The annual series returns to Vermont next summer.